Jalapeño peppers are those little green things that they look really spicy, but they are not, they are just some really good chillies and as my son Emilio calls them, they are little green torpedoes that can add lots of flavour to your food, you can eat them raw, pickled, cooked, stuffed, well, the ideas are endless. Today I am using jalapeño peppers and I am making a recipe inspired by one of the many talented ladies that I admire in Instagram, her name is Lale @berlin_soulfood, if you do not her, take a look at her delicious food in Instagram and start following her, yoy will be surprise by her imagination on how to present food and how to mix flavours. I’m stuffing the jalapeños with goat cheese and we will eat them as a starter, it is a brilliant idea if you have a party, you can prepare them in advance and keep them in the fridge until you need them, they can be eaten cold or hot. Preheat the oven to gas mark 6 or 180 C degrees. Place the jalapeños on a baking tray, no need to add oil or salt. Leave to bake for around 20 min and then take them out and put them in a plastic bag and leave aside. Prepare the filling. Mix the goat cheese with some chopped coriander and leave aside. Slice the radishes and chop the salad leaves, also ground the three pieces of pork crackling in a pestle and mortar. If you do not have chilli oil, replace it for fresh salsa or just avoid this ingredients. Once everything is ready, take the jalapeños out of the bag and peel the skin off and then make a long incision and take all the seeds out. 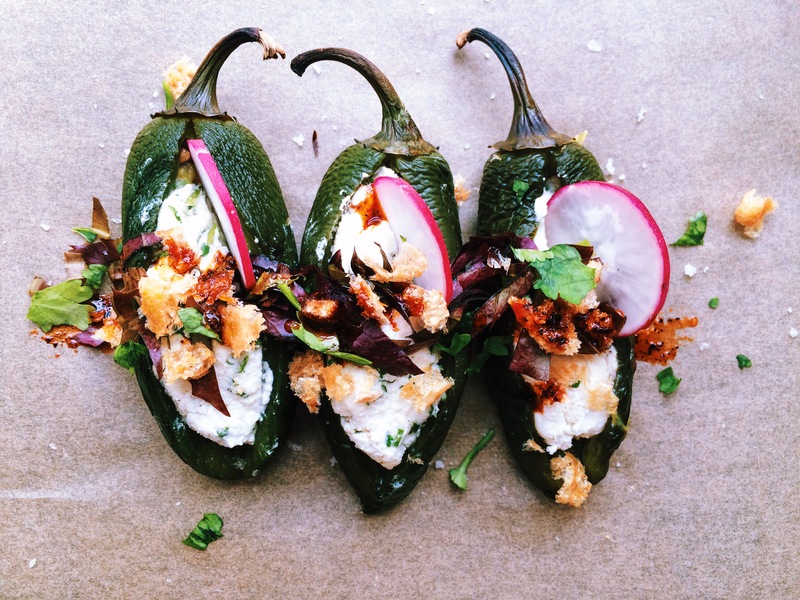 Make small oval balls with the goat cheese and fill each chilli. If you want to serve them out, place them in the oven for 10 min or you can also serve them cold. To serve, place them on a nice plate, scatter some salad leaves, a slice of radish, pork crackling and chilli oil. Enjoy them as a starter, nibble or if you make more as a main dish.